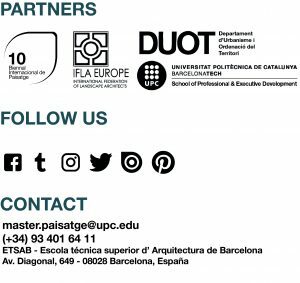 GREEN SYSTEMS: FROM URBAN GREEN TO NATURAL AREAS – Master in Landscape Architecture Barcelona – Universitat Politècnica de Catalunya – 35ª EDITION. The workshop is held over seven weeks, will start on Tuesday January 7th, ending the program on February 28th, 2020. Classes are Tuesday through Friday from 3.30 p.m. to 8.30 p.m.
We work on the concept of GREEN INFRASTRUCTURE, analyzing the territory, we will know its structures, its functionality and the ecosystem services that they provide. The workshop will be oriented to project experimentation based on the consideration and management of biodiversity and the implementation of an ecosystem, considering its emerging properties applied to landscape design. In the workshop of GREEN SYSTEMS the students will study the territory through the identification of their green infrastructures, assess their situation and potentialities, propose interventions in order to establish, consolidate and improve it. They must establish the sequence of actions to be developed, their evaluation in terms of improving the systems and their results in place, as well as considering their evolution over time. The final project must articulate a proposal planned in time, that responds to the conflicts that occur in the study area and enhances its values ​​in order to feed ecosystem services to the populations that surround it. To understand the relationship between urban society and medium, we have to understand the city as an ecosystem: a complex system of relations between biotic and abiotic elements, as well as from an integrating core and its complementary periphery. The maintenance of urban systems complexity is based on the exploitation of resources located in areas more or less distant. References to the metabolism of the city, or in the periodic invasion that urbanites make to the surrounding territories in search of recreation, we have to contemplate them from the exploitation perspective. In a planetary scale, the phenomenon of tourism is the evident test of “urban” exploitation of nature. Ecosystems and Complexity have already been mentioned. Another on the approach to the relationship between environment and biodiversity. This term is characterized as a measure of environmental quality; as well, another keyword is repeated: the hierarchical variability among living organisms and the ecological ‘complexities‘ which they are part of. A measure, perhaps, immeasurable. Consequently, a topical argument for biodiversity is that it is impossible to protect that which is unknown. Today, however, is not to preserve ‘stuff’ but processes… Moreover, we can ask ourselves: what is the minimum amount of territory to maintain a population? Or what is the critical number of individuals to keep a species? As Jaume Terradas warned us long ago, variation and osmosis between geographical species tiles form a continuum rather than regions with diaphanous limits. Thus, the biodiversity measure is not easy to apply.